The most abundant sources of selenium are Brazil nuts, seafood, meat and poultry. People at risk of selenium deficiency include those with a restricted food intake, such as pregnant and lactating women, slimmers, vegetarians and the elderly). It is recognised that soils in the UK are deficient in selenium, often as a result of continual or intensive farming. Selenium is an essential component of the key antioxidant enzyme glutathione peroxidase, which acts in concert with other types of antioxidants (particularly vitamin E) to protect the body from the effects of free radicals. Selenium helps to maintain a healthy immune system. 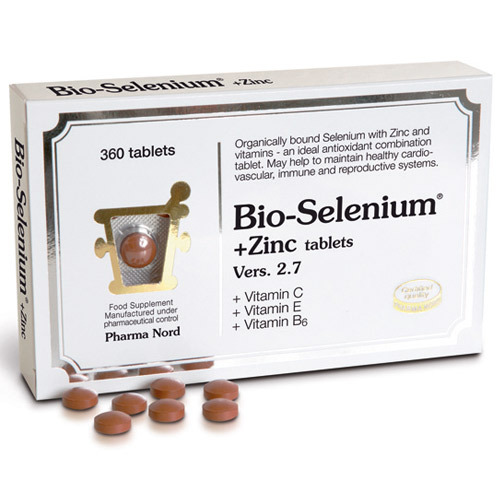 Selenium also plays important roles in the control of normal thyroid hormone metabolism, and in maintaining male fertility. Selenium also helps to support the immune function and thyroid/adrenal hormone metabolism. Toxic effects can occur after intakes above 900µg per day; symptoms can include hair and nail loss. 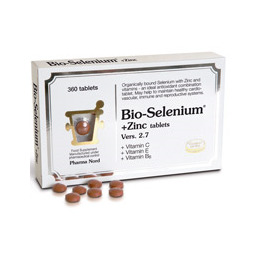 Below are reviews of Pharma Nord Bio-Selenium+Zinc - 360 Tablets by bodykind customers. If you have tried this product we'd love to hear what you think so please leave a review. I have been using this product for many years. I used to buy these tablets from a well known shop, 30 tablets for approx. £9.00. I found out that it was cheaper to buy them in bulk and I am delighted with the saving! Combination of antioxidants - selenium, zinc, vitamins B6, C and E. All act synergistically to promote cardiovascular health. Zinc also helps support the immune system.